With Rob Cowan. CD of the Week: Russian Overtures and Orchestral Works; Artists of the Week: Jascha Heifetz and Gregor Piatigorsky; Essential Choice: Szymanowski: Stabat Mater. with Rob Cowan and his guest, the stage and screen actor Henry Goodman. A selection of music, including the Essential CD of the Week: Russian Overtures and Orchestral Works ? Russian National Orchestra, Mikhail Pletnev: NEWTON CLASSICS. We also have our daily brainteaser at 9.30. 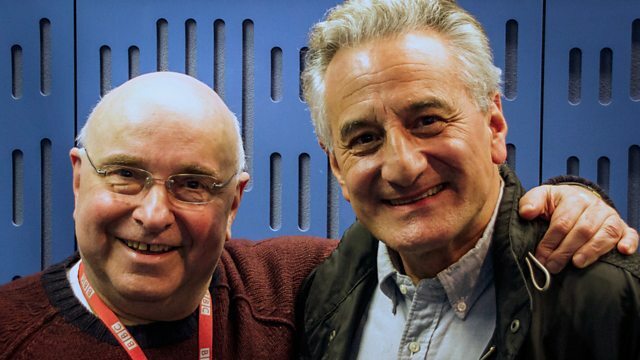 Rob's guest this week is the stage and screen actor Henry Goodman. A graduate of RADA, Henry has twice won the Olivier Award for his stage performances: in 1993 for Assassins, directed by Sam Mendes, and again in 2000 for The Merchant of Venice, directed by Trevor Nunn. His many stage appearances include, for the Royal National Theatre: Angels in America, Cat on a Hot Tin Roof, and Guys and Dolls; for the Royal Shakespeare Company: Richard III (in the title role), Henry V and The Comedy of Errors; and Chicago at the Adelphi Theatre. In 2010 Henry played the role of Sir Humphrey Appleby in the stage version of Yes, Prime Minister at the Chichester Festival. His television work includes guest appearances in a host of series, including Spooks, Dalziel and Pascoe, and Foyle's War, and he has also appeared in films such as Taking Woodstock, The Damned United and Notting Hill. Orchestra: English Baroque Soloists. Conductor: Sir John Eliot Gardiner. Orchestra: Russian National Orchestra. Conductor: Mikhail Pletnev. Conductor: Vladimir Jurowski. Orchestra: London Philharmonic Orchestra. Performer: Philippa Davies. Orchestra: Academy of St Martin in the Fields. Director: Iona Brown. Today's Brainteaser - Originally Written For...? Performer: Jascha Heifetz. Performer: William Primrose. Performer: Gregor Piatigorsky. Performer: Jascha Heifetz. Performer: Israel Baker. Performer: William Primrose. Performer: Virginia Majewski. Performer: Gregor Piatigorsky. Singer: Elzbieta Szmytka. Singer: Florence Quivar. Singer: John Connell. Choir: CBSO Chorus. Orchestra: City of Birmingham Symphony Orchestra. Conductor: Sir Simon Rattle. Orchestra: London Symphony Orchestra. Conductor: Pierre Monteux. Singer: John Shirley‐Quirk. Performer: Benjamin Britten. Mozart's Fantasy in F minor K.608 was originally written for a mechanical clock. The version played was an arrangement for wind quintet.